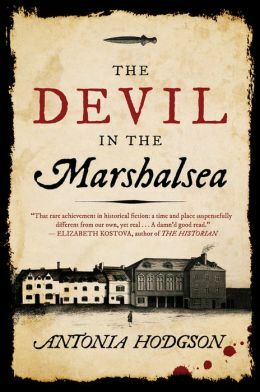 Finding Antonia Hodgson’s The Devil in the Marshalsea in Heathrow terminal was the bonus to my recent trip. This historical thriller has elements of Zafon’s swashbuckling Prisoner of Heaven and Charles Dickens’ attention to detail, with characters who actually lived and survived the horrors of the eighteenth century debtors’ prison in England. The hero, a handsome rake who has strayed from his family’s upstanding and wealthy status, finds himself in debt from gambling, and confined to the debtors’ prison in the Marshalsea. The prison is more of a city community with the poor suffering horrible conditions (chained to dead bodies for punishment the least of them) and the rich who can afford patrons with money to buy daily necessities and comforts enjoying a better, yet still confined, existence. All are in prison, nevertheless, and at the mercy of the turnkey (warden). Hodgson’s research brings the time and place to life, creating a murder mystery and thriller as Tom Hawkins, our handsome hero “with great calves” finds himself confined within the infamous debtors’ prison as the roommate to the “devil,” Mr. Fleet, a well-connected former spy, who supposedly killed his former roommate, Mr. Roberts, who now roams the halls as a ghost. Tom enters into a pact to prove how and who killed Roberts, before he becomes the next victim. The story twists and turns, maintaining the suspense, while revealing horrors and conditions that are based on real happenings and people. Even the ghost is based on historical data. Hard to believe conditions were so miserable, yet Hodgson proves her research in an afterward. The book reads like a thriller, while educating the reader. Perhaps most pointedly, Hodgson manages to convey, through the connivance and betrayals, that people back then were the same as some today. As an added bonus, the book offers an invitation to a book club – The Richard and Judy Thornton Book Club – through WHSmith, with lists of books and discussions. I found some enticing titles. This entry was posted in authors, book review, books, historical fiction, history, mysteries, reading, romance and tagged Antonia Hodgson, Charles Dickens, Devil, eighteenth century prisons, England, historical fiction, Hodgson, Marshalsea, Prison, Richard and Judy, The Devil in the Marshalsea. Bookmark the permalink.